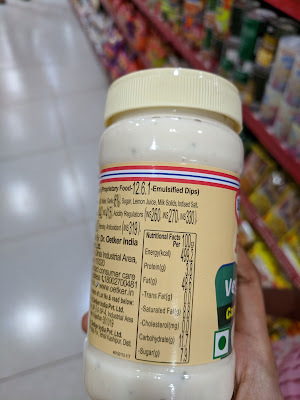 Mayo or Mayonnaise has become so popular in India, that almost every urban household has a jar stocked up in their pantry. It is liberally spread on top of sandwiches or used as salad dressings to get the creamy texture. The original version of mayonnaise was made with egg yolks, lemon juice (or vinegar) and oil. My post is all about the vegetarian/eggless version of Mayo. Are we so addicted to the taste that we don’t bother to look at what goes behind an eggless mayo? 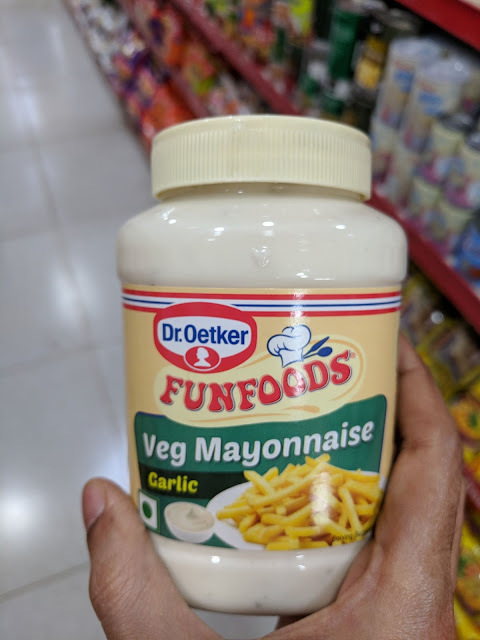 A popular Indian food blogger with 1M+ followers on Facebook shares a picture of Veg Mayo and asks her audience to share ideas to use it in various ways. Given her “influential” status, how much difference could she make if only she writes about the harmful ingredients in such packaged foods? She would help millions of people to make informed food choices, but NO…she chose to collaborate with such junk food brands and crowdsource recipes to increase adoption and consumption of such junk foods. 1) First and foremost, sodium level is not mentioned in the nutrition facts. The addictive nature of mayo is primarily due to high salt, and the brand conveniently misses sharing this information with consumers. 2) The amount of fat is nearly 50% of the pack i.e. around 50 gm of fat in 100 gm of veg mayo. Where are these fats coming from? Refined soyabean oil, the first listed ingredient. Refined oils are extremely unhealthy for the human body, causes inflammation and contributes to various lifestyle disorders such as diabetes and cardiovascular disease. 3) Just look at the list of ingredients starting with INS. Each of these ingredients are added to get the right texture, to increase shelf life, to prevent mold formation etc. Regular consumption of such synthetic food additives are detrimental to health. “With great power comes great responsibility” - It is seriously disgusting to see such food “influencers” promoting junk, without worrying about repercussions of their actions. How these social media influencers are misusing their powers! What’s the difference between such people and corrupt politicians? 'Once in a while', is not an excuse. Are we willing to be betrayed/cheated/harassed once in a while ? When we deserve the best for our minds, our body also deserves the best. Because mind, body and spirit are one. Low quality in one, will affect all three. Stop eating store-bought bread. Consumption of all unhealthy add-ons will automatically reduce - mayo, cheese, tomato ketchup, chocolate spreads, jams etc. Please suggest a healthy oil for cooking and frying.